Thucydides of Athens, one of the greatest of historians, was born about 471 BCE. He saw the rise of Athens to greatness under the inspired leadership of Pericles. In 430, the second year of the Peloponnesian War, he caught and survived the horrible plague which he described so graphically. Later, as general in 423 he failed to save Amphipolis from the enemy and was disgraced. He tells about this, not in volumes of self-justification, but in one sentence of his history of the war--that it befell him to be an exile for twenty years. He then lived probably on his property in Thrace, but was able to observe both sides in certain campaigns of the war, and returned to Athens after her defeat in 404. He had been composing his famous history, with its hopes and horrors, triumphs and disasters, in full detail from first-hand knowledge of his own and others. The war was really three conflicts with one uncertain peace after the first; and Thucydides had not unified them into one account when death came sometime before 396. 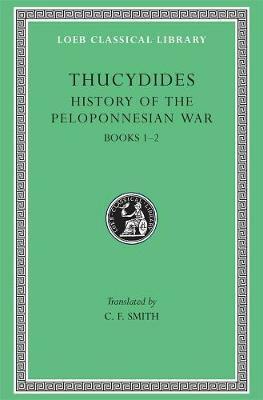 His history of the first conflict, 431-421, was nearly complete; Thucydides was still at work on this when the war spread to Sicily and into a conflict (415-413) likewise complete in his awful and brilliant record, though not fitted into the whole. His story of the final conflict of 413-404 breaks off (in the middle of a sentence) when dealing with the year 411. So his work was left unfinished and as a whole unrevised. Yet in brilliance of description and depth of insight this history has no superior. Charles Forster Smith (1852-1931) was Professor of Greek and Classical Philology at the University of Wisconsin-Madison.